Thanks for stopping by! We are passionate educators who love helping students in the Henderson and Green Valley area. Reading, writing, math, SAT Prep—no problem. Kindergartners and seniors—both are welcome. We do it all. 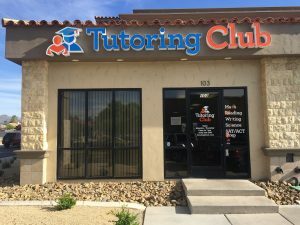 Since 2001 (we are one of the first Tutoring Clubs! ), we have provided thousands of individualized education plans for students to help them achieve their potential. Struggling with math? Looking for enrichment? Our tutors and staff have you covered no matter your needs. First thing’s first: let us get to know you. Complete the form on this page to request more information and we will promptly return your call. Or, if you’re someone who would rather see us in action, stop by sometime and we’ll be happy to talk with you. We are a family-owned business located on 2213 N. Green Valley Pkwy., near McDonalds. You can't miss us (we think our signs look awesome!). Hope to talk to you soon! 2213 N. Green Valley Pkwy. I have absolutely NOTHING negative to say about tutoring club. I LOVE this place! The staff is amazing and caring. They greet us with a smile and by name everytime we walk in. The tutors take the time needed for her and push her when they know she can do it. I took my daughter who has adhd there when her school was failing her tremendously. She started at turtoring club the beginning of 2nd grade, she was reading at kindergarten level and before her school year was out she is middle into a 3rd grade level. They helped her when nobody else could. Im extremely grateful for their help. They treated her like a child instead of a test score and now her confidence is higher than it has ever been. I have and always will recommend turtoring club to anyones child that needs help, they really do care and thats hard to find. This is a great tutoring program for all ages. My son is 15 years old and got tons of help for his math class. Everyone there is super outgoing and very professional. They have great scheduling and can be fairly flexible if your child has afterschool activities. Nicole began her career in education twenty-five years ago by teaching post-secondary academic and vocational English and French. Her undergraduate work from Indiana University - Bloomington in French language and literature and Business inspired her to continue in academia. Nicole subsequently continued her graduate work in Applied Linguistics from Indiana University-Purdue University and Art History from Southern Methodist University. She has also taught college-level English, public speaking, accent reduction, writing, and literature for ESOL students. Nicole’s interests are international travel, foreign affairs, flamenco, anthropological linguistics, and martial arts.